Mr Manish Mundra, Managing Director and Chief Executive Officer (CEO) of Indorama Nigeria, said while fielding questions with journalists on tour of their petrochemical complex at Eleme, Rivers, at the weekend, that their speedy success profile would challenge Federal Government to pay greater attention to the non-oil sector of the economy, especially petrochemicals and gas. Mundra said that their added new investments in fertilizer plant and a new port at Eleme and Onne, respectively, remains an attestation of the inherent revenue potential in the nation’s non-oil sector. Apart from expanding and turning Indorama Eleme Petrochemical into a cash cow, post privatisation, the Indorama Nigeria CEO explained that the acquisition of the then ailing Eleme Petrochemicals gave birth to new foreign direct investment in the Nigerian real sector worth $1.53 billion (N301.41 billion) in 36 months. A breakdown of the investment showed that $1.4 billion (N275.80 billion) was committed into Indorama Fertilizer Plant Eleme, while $130 million (N25.61 billion) was also used for the construction of a new Indorama Port Complex at Eleme. The 1.4 million metric tons capacity per annum fertilizer plant is supported with 84-kilometer new gas pipeline that feeds the plant with natural gas needed in the production of 4000 metric tons of urea per day. The other components of the investments include 2,300 metric tons per day ammonia plant and special port complex for the export of urea based fertilizer. Independent reports that the port complex designed especially for the export of urea fertilizer comprises of marine facility of 320 meters quay to handle vessels ranging from 5000 deadweight to 35000 deadweight. The other facilities within the port include a power plant, water, waste water treatment and disposal and other utilities for water bunkering, firefighting, engineering workshop and administration block. Excited Mundra said that the completed twin projects scheduled for inauguration in April would assist in the aggressive revitalization of the nation’s agricultural sector, provide needed fertilizer for farmers, improve crop yield, fight hunger and poverty, and expand employment opportunities. 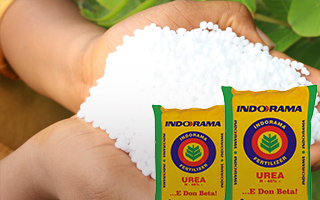 Indoram Nigeria CEO argues also that Indorama fertilizer would leverage the nation’s on global fertilizer map as both producer and exporter of fertilizer. Mundra also projected that the fertilizer plant would fast track Nigeria’s fertilizer per capita consumption capacity beyond the Food and Agricultural Organisation’s 100 kilogrammes from the current nine kilogrammes. According to him, the company’s business model from April 2016 remains the sale of between 400,000 tons and 500,000 tons of urea fertilizer annually locally and the export of one million tons in the first year of operation. The nation’s huge agricultural market, he said, also compelled Indorama Eleme Fertilizer and Chemicals Ltd to target the sale of one million tons of urea fertilizer in the domestic market and export of between 300,000 tons and 400, 000 tons. 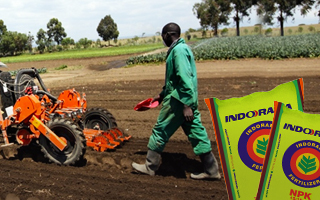 Indorama Nigeria optimistic estimation, the CEO said, stemmed from the nation’s huge natural gas resource, agricultural potential and nearness to the American and European fertilizer markets. 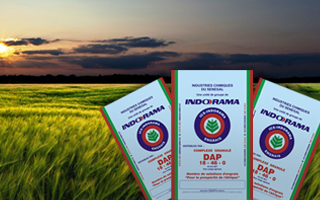 Independent recalls that the ground breaking ceremony for the fertilizer plant was performed by the chairman of Indorama Corporation, Mr S.P Lohia, in April 2013. The projects, Independent also gathered were funded by Indorama Corporation, International Finance Corporation and some Nigerian banks.